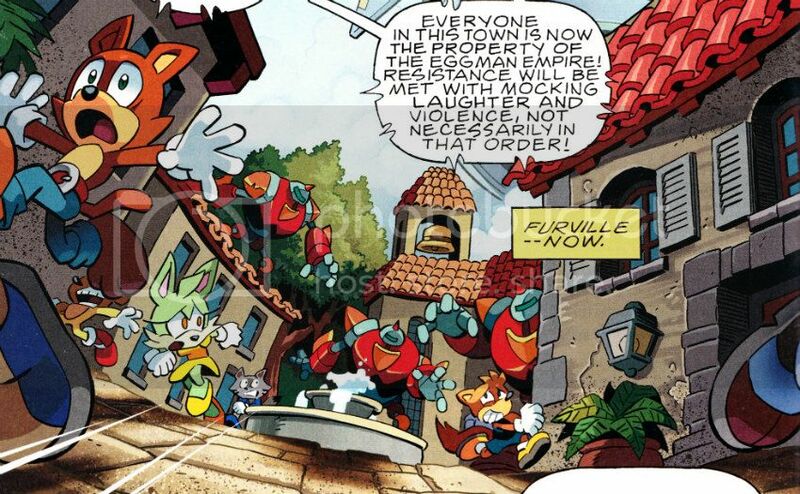 Furville was a Mobian city and settlement on the planet Mobius. According to Sonic the Hedgehog, its population was "a lot". Sonic ran to the town in the middle of the night to warn the locals about the impending arrival of the super-sized Caterkiller. The town was apparently some distance away from Mobotropolis and Knothole, as some of the locals didn't even know who Sonic was. Additionally, many of the citizens were unaware that Dr. Eggman had replaced the deceased Dr. Ivo Robotnik, despite him having been present in Mobius Prime for months. The town was saved from Caterkiller when Tails managed to get inside the robot (with Sonic's help) and reprogram it to change course and fall into the water.